Sacred Heart is atop a bluff that overlooks the city. The distinctive twin towers give it a signature look. 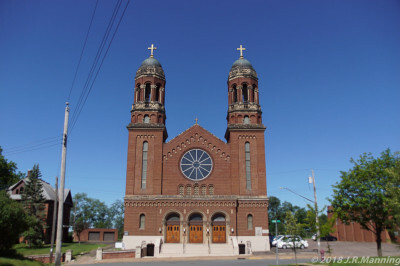 "Located on a prominent bluff overlooking the city, Sacred Heart Church is characterized by identical metal-covered twin towers, each supporting a Latin cross. Rose-colored windows and round arched openings are significant features of the building. "Eau Claire’s Catholics organized a congregation in 1858 and constructed a small frame church on North Barstow Street. Originally called St. Peter’s Church, it was renamed St. Patrick’s (see #26) in 1865. 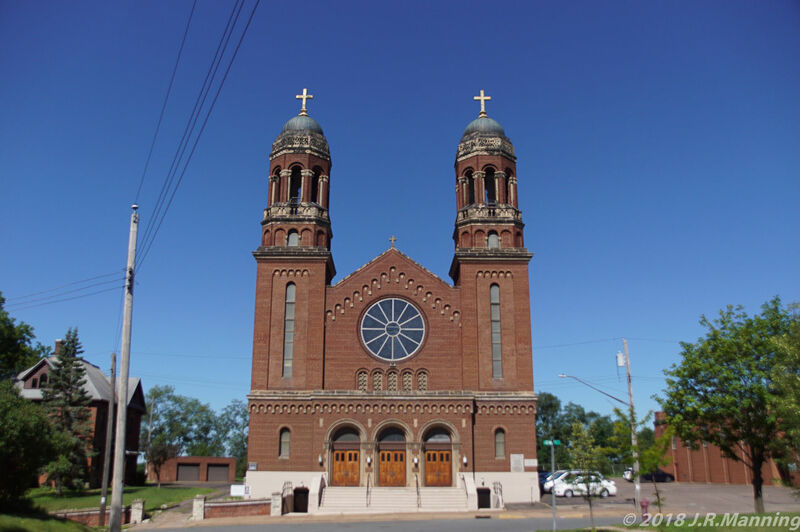 About ten years later, sixty German-speaking families left the church to form their own parish, Sacred Heart. They built a frame church and school on this site but soon replaced them with brick structures, a church in 1880 and a school in 1910. Sacred Heart Hospital, founded in 1889, was constructed just north of that church (see #106). The present church building was completed in 1928. In 1999 a new parish, Sacred Heart of Jesus-St. Patrick, recombined the two oldest Catholic congregations in the City."